This is a plea for help from anyone out there making French Baguettes regularly. I have been baking them for a while now and have managed to get the right balance between crispy crunchy crust and soft inside. I always use T65 flour. I just can't seem to get them to shine the way they should do. Have you any techniques or suggestions that will help? Mix the Poolish ingredients the night before, cover & ferment at room temperature, overnight. Weigh bread dough ingredients directly into mixer bowl onto the Poolish. Mix for 3mins speed 3-4 until you have smooth & elastic dough. Cover with cling film and leave for 40 mins. Scrape out onto floured bench and fold dough with 2 book folds, re-cover & re-prove for 40mins more. Shape 3 batards (280g each), then place baguettes on well-floured couches. Cover with greased cling film & leave in warm place for 15mins. 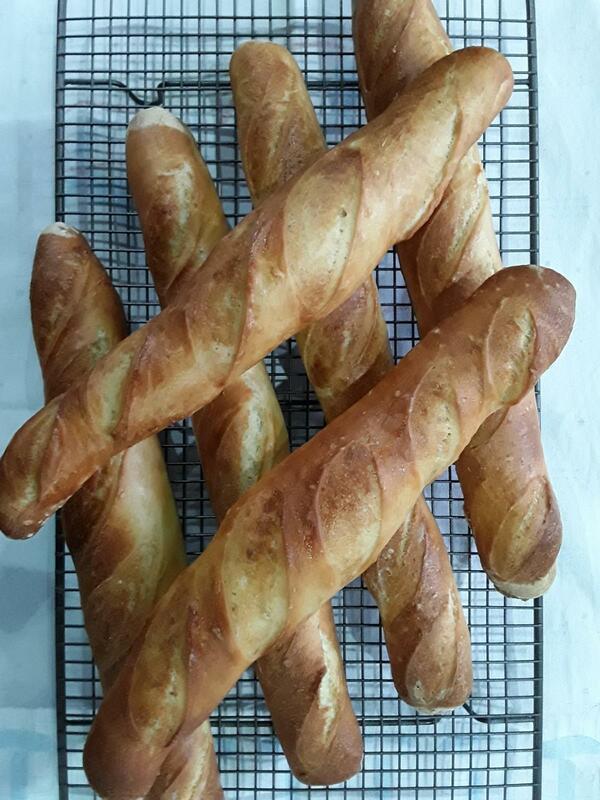 Preheat oven to 200°C, make several slashes at 45° to perpendicular diagonally along the length each baguette loaf with a sharp knife. Spray with water. Bake & spray every 10 mins for 25-30 mins at 200°C turning down to 180°C for the last period. Open the oven door for the last 2-3 mins to make crust crispier. Tap the bottoms sound hollow and if not, return to oven upside down for 5 minutes. Tip out onto a cooling rack and leave to cool.